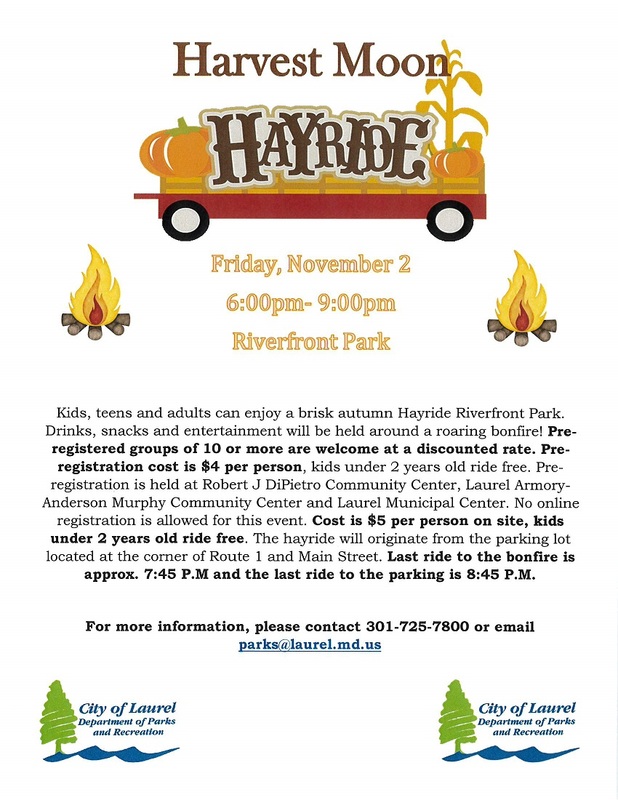 Kids, teens and adults can enjoy a brisk autumn Hayride along the Patuxent River. Drinks, snacks and entertainment will be held around a roaring bonfire. Pre-registered groups of 10 or more are welcome at a discounted rate. Pre-registration cost is $4 per person, kids under 2 years old ride free. Pre-registration is held at Robert J DiPietro Community Center, Laurel Armory-Anderson Murphy Community Center and Laurel Municipal Center. No online registration is allowed for this event. Cost is $5 per person on site, kids under 2 years old ride free. The hayride will originate from the parking lot located at the corner of Route 1 and Main Street. Last ride to the bonfire is approx. 7:45P.M and the last ride to the parking is 8:45P.M.